Description: Konnichiwa! Prepare yourself to be amazed by the beauty of japanese culture and its dazzling fashion icon: The Geisha. 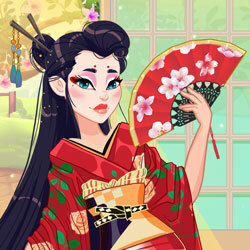 Find the ideal make up for the beautiful geisha and then mix and match the kimonos and fans to create the perfect outfit. Have fun!